The best rummage sale purchase I ever made was a piece of hardware that used Reverse Polish Notation. I know what you’re thinking… RPN sounds like a sales gimmick and I got taken for a fool. But I assure you it’s not only real, but a true gem in the evolution of computing. Best rummage sale find ever! Sometime in the 1980s when I was a spotty teen, I picked up a calculator at a rummage sale. Protected by a smart plastic case, it was a pretty good condition Sinclair Scientific that turned out when I got it home to have 1975 date codes on its chips, and since anything with a Sinclair badge was worth having it became mine for a trifling amount of money. 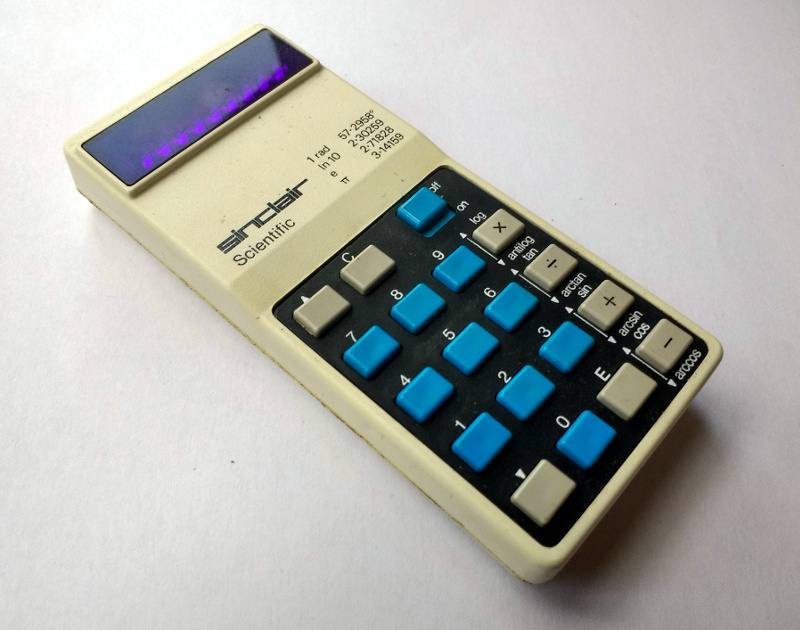 It had a set of corroded batteries that had damaged one of its terminals, but with the application of a bit of copper strip I had a working calculator. And what a calculator! It didn’t have many buttons at a time when you judged how cool a scientific calculator was by the prolific nature of its keyboard. This one looked more akin to a run-of-the-mill arithmetic calculator, but had button modes for trigonometric functions and oddly an enter key rather than an equals sign. The handy sticker inside the case explained the mystery, this machine used so-called Reverse Polish Notation, or RPN. It spent several years on my bench before being reverently placed in a storage box of Sinclair curios which I’ve spent half a day turning the house over to find as I write this article. What does a hacker do when he or she wants something but can’t afford it? They hack one together, of course. Or, in the case of [Ramón Calvo], they thoughtfully plan and prototype. [Ramón Calvo] wanted a scientific calculator, but couldn’t afford one, so he designed and built one himself. [Ramón] started off with Arduino but upgraded initially to Freescale’s Freedom KL25Z development board upgraded to an ARM Cortex-M0+ programmed using mbed. The display is an Electronic Assembly DOGL-128 128×64 pixel LCD. [Ramón] did a couple of iterations on the PCB, going from a large DIY one in order for the Arduino version to work, to the current, smaller version for the ARM chip with hand soldered SMD components. After that, [Ramón] looked into the algorithms needed to parse mathematical input. He settled on the shunting-yard algorithm, which converts the input into Reverse Polish Notation (RPN), which is easier for the software to work with. [Ramón] has a ton of features working, including your standard add, subtract, multiply and divide operations, square root, nth root and exponentiation, trigonometry, log and log10, and factorial(!) There are a few things still on the to-do list, such as low power and a graphing mode, and there are a couple of bugs still in the system, but the overall system is up and running. [Ramón] has put up the schematic and KiCAD files up on his Hackaday.io project page along with the bill of materials. We’ve had a few Hackaday prize entries in the form of calculators, such as this one with Nixie tubes and this one that emulates 70’s HP calculators.